...as mentioned during my recent performance of Threshold:NRC in June at PACT theatre, Sydney. If you'd like to know more about how you can get involved in general and specific marine environmental conservation and other awareness-building strategies, direct actions, upcoming group/community activities, conferences and workshops, please subscribe to my monthly e-newsletter. We see this a lot these days. 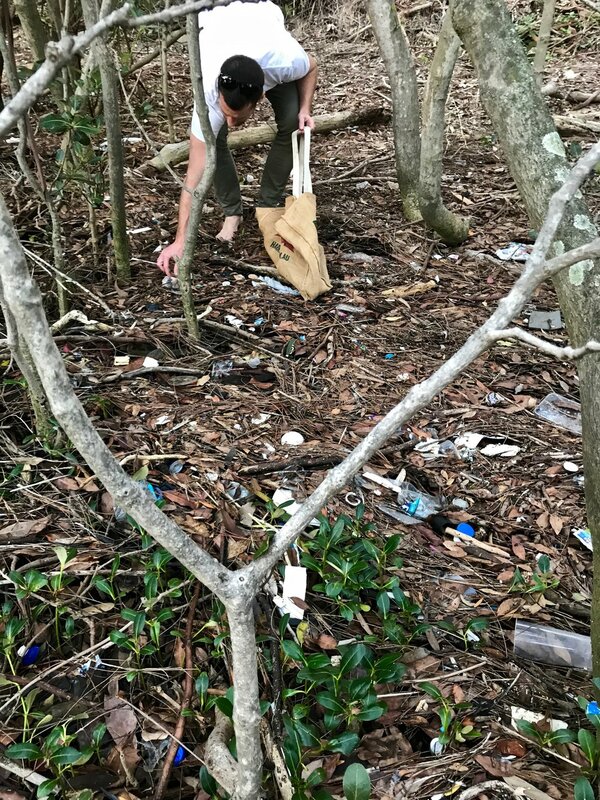 Plastic bags entangled in mangrove shoots or even buried beneath sand, Gladesville, Sydney. so what can we each do right now about the urgent issue of plastic pollution? Plastic is everywhere in our lives. It is extremely difficult to avoid it these days and some plastic items are vital to our daily lives and health and well-being. But there are countless other items that are not and can be avoided. It is just about getting into the mindful not mindless mode of buying, usage, proper recycling or avoiding altogether. Knowing what to avoid and how we can each help is a big plus. Exposure to the knowledge of why we must do this and then practicing consistency gives us a sense of empowerment that we're each doing something and our choices send a clear message to manufacturers and government that we are appalled by and tired of being inundated with plastic. Especially single-use. But the decision not to buy these items falls solely on us. Embracing this fact is actually a very empowering choice for us, our families, the generation and the countless species in direct line of fire from plastic pollution - and really, that does include us. In 2014 I was invited to present a 30-minute talk and physical demonstration of my embodied marine environmental practice and research, known as PrimeOrderly, at the World Parks Congress (WPC), held for the first time in Australia, at Sydney Olympic Park. WPC is hosted once every decade by the IUCN / ACIUCN (Australian Committee / International Union for the Conservation of Nature). My presentation was in collaboration with invasive species scientist, Dr. Judy Fisher, who is Chair for Ecosystems and Invasive Species for the Commission on Ecosystem Management (CEM), incorporating Indigenous, spiritual and cultural connections to nature. This is the Thematic Group, also apart of IUCN, and has an Expert Membership from 49 countries. After my presentation numerous delegates from across the globe came to discuss it with me and I have since struck up an ongoing connection with them, sharing stories, research and performances / presentations. To which I replied, “we need one another”. The amount of plastic we use daily can be radically reduced through simply becoming more aware of what we buy. It is a supply by demand world, so becoming more mindful of not demanding wasteful products is a very pivotal first step. Say no to plastic bags and single use plastic. We need to put a wedge in between mindless shopping and mindful shopping. If you see any discarded plastic anywhere pick it up. Have a spare bag handy to put it in until you find a yellow top or other recycling bin. Don't not purchase any fruit and veggies wrapped in plastic (this is a very new phenomena and we need to show our disapproval through not purchasing fresh produce wrapped in plastic). Chose wooden toys for your children and pets. Get resourceful, make them! Find other uses for the plastic refuse - I'll soon make up a list of the creative and long term things you can do with certain plastic items in our homes. Use glass jars to keep food fresh in your fridge. Do not buy water in plastic bottles! Numerous environmental scientists and renowned conservation agencies have said we currently have enough plastic manufactured (existing) in the world to last several lifetimes (over 400 years! ), if better collection and recycling facilities and methods were immediately put in place. Expense is no excuse - it is a false economy argument! Get more knowledge through watching key documentaries and encourage friends to watch them too. In fact, why not organise a dinner party around watching one or two? Become part of the discussion by facilitating it and help generate a move towards solutions. 18 minutes, one person, Wallumatta Bay, Gladesville, Sydney, 2014. Also used in PlastiCities. Take photos of plastic debris, especially large-scale and around any waterways and send them into that local council and ask what they're doing about it. The ocean refuses no river, and as such, it cannot refuse the plastic flowing within them - but we can. Write to your local member and ask them to do all they can to engage in better recycling processes and to bring it to parliament as a major issue we need to address in our greater societal practices. Demand they spend the money to build far more effective recycling systems and strategies like other progressive countries are. Bring our plastic recycling percentage closer to 100% than its current 40%! In rehearsals for new 60-minute production, Threshold:NRC in May 2018 at PACT Theatre as a double bill with choreographer Cloé Fournier and her work, Humanoid. Here I'm sorting out the natural debris from the plastic that was used to build and installation 'Bird Island' in the work. Wicked ironies abound - 'more smart, more safe, Mortein'. Lane Cove, Sydney. Huge amounts of micro plastics are found beneath washed up natural debris. Never assume a site that appears at first clear is. Rummage a little and you'll discover that a lot more plastics have fallen beneath. Gladesville Park, Sydney 2018. Between 5 of us, over 8 weeks and barely 4 hours, above and below water surface, we collected close to 460kgs of plastic! This was all used, to alarming effect, in Threshold:NRC performance about a third the way in. Photos and footage of that work coming soon. The debris has been sorted to be used again in the near future for a remount and what isn't has been taken directly to recycle stations. As mentioned in the list above.